pride in the fact the building was designed so it could be expanded in future years. a $2 million expansion more than doubled the size of the existing building. of Huntington and Huntington Steel and Supply Co.
in 1904. The name was later changed to Huntington Steel and Supply. became the Guaranty National Bank in 1954.
the corner, in a new building erected at 919 5th Ave.
designed so it could be expanded in future years. than doubled the size of the existing building. 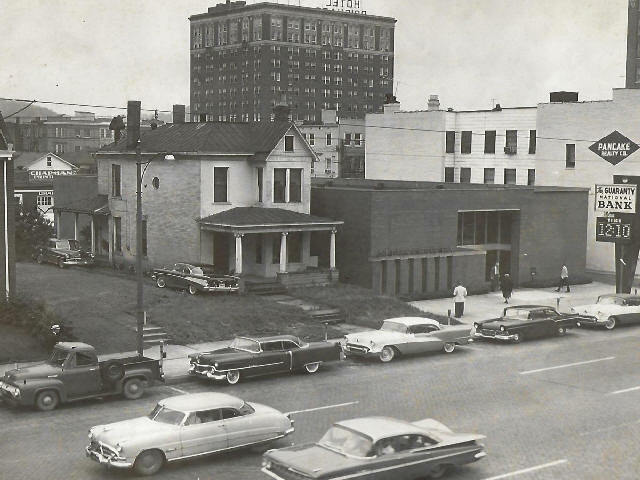 When Guaranty first opened its doors in 1939 it had assets of $500,000. bank changed its name to Commerce Bank. named for the city of Huntington and did not originate here. Huntington National Bank of Columbus. Note: This Article and picture appeared in the Herald-Dispatch Newspaper on April 1, 2019.